SINGAPORE — Asian shares were mostly lower Monday on reports that President Donald Trump will soon place tariffs on $200 billion more of Chinese goods, even as officials worked to iron out tensions between the world's two largest economies. KEEPING SCORE: South Korea's Kospi fell 0.8 percent to 2,300.83 on Monday. Hong Kong's Hang Seng index tumbled 1.9 percent to 26,768.17. The Shanghai Composite index lost 1.0 percent to 2,654.13. But Australia's S&P/ASX 200 rose 0.3 percent to 6,183.30. Japanese markets were closed for a national holiday. Stocks fell in Taiwan and Southeast Asia. WALL STREET: On Friday, smaller U.S. companies posted gains on signs of sustained economic growth, while the rest barely moved. The S&P 500 index was almost flat at 2,904.98. The Dow Jones Industrial Average was less than 0.1 percent higher at 26,154.67. The Nasdaq composite gave up under 0.1 percent to 8,010.04. The Russell 2000 index of smaller-company stocks, which is less vulnerable to flare-ups in trade tensions, added 0.4 percent to 1,721.72. US-CHINA TRADE: On Saturday, The Wall Street Journal reported that Trump was going ahead with plans to impose new tariffs on about $200 billion of Chinese imports. It cited unnamed people familiar with the matter who said the tariff level will likely be set at about 10 percent, below the 25 percent announced earlier this year. At the same time, U.S. officials, led by Treasury Secretary Steven Mnuchin, are preparing to hold new talks on the tariff dispute with Beijing. Envoys from the two countries last met on Aug. 22 in Washington but reported no progress. The two governments have already imposed 25 percent tariffs on $50 billion of each other's goods. Beijing has issued a list of another $60 billion of American products for retaliation if Trump's next tariff hike goes ahead. ENERGY: Benchmark U.S. crude dropped 3 cents to $68.96 a barrel on Monday. The contract added 0.6 percent to settle at $68.99 a barrel in New York. Brent crude, used to price international oils, gained 1 cent to $78.10 a barrel. It shed 0.1 percent to $78.09 a barrel in London. 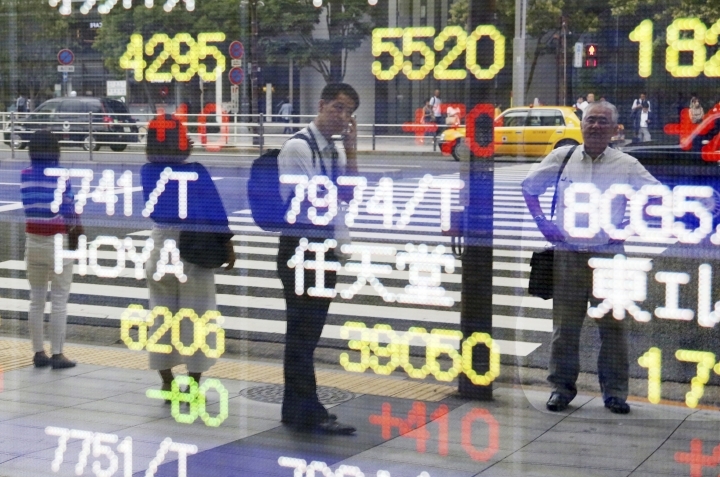 CURRENCIES: The dollar eased to 111.99 yen from 112.03 yen. The euro rose to $1.1635 from $1.1632.